A fragrant early white double that has remained a popular choice for more than 100 years. Large, fragrant flowers feature distinctive flecks of crimson. It's anemone-to-bomb flower form features a mix of yellow to white petals and petaloides at its center. Two-time winner of the American Peony Society's Gold Medal. 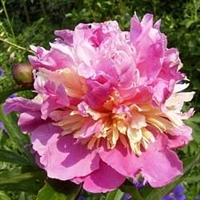 This tall, graceful single-form peony features large, lively pink flower petals encircling a center of complimentary yellow stamens. A big, bold double red with sturdy 34-inch stems. This is a full, classy-looking rich, rose-pink double flower. A classic pink double possessing wonderful scent. Fully double red blooms sit atop stems that top out at 4 feet, early-season. This large-petaled, fully double peony holds its flowers up well on sturdy 26-inch stems. This blush white gets its name from its large, double flowers which are a lovely gardenia form. Extend the bloom season with this late to very late white, double rose-form peony. Rich red double flowered peony that blooms on 40-inch tall, thick stems. A fragrant, true red double flowered peony. This will spice up the garden when it opens up its display of double pink blooms. Copyright © 2013 Fina Gardens LLC. All Rights Reserved.